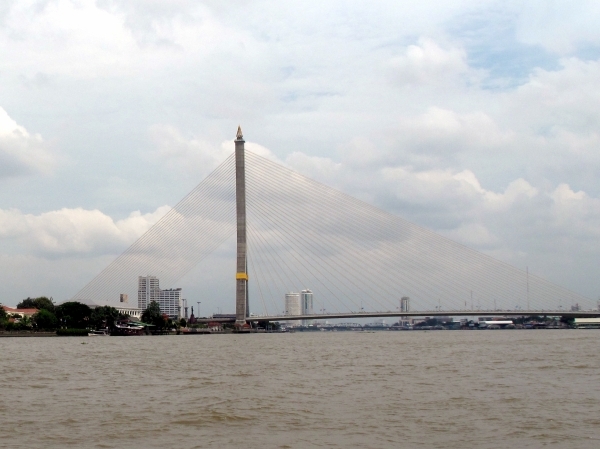 Completed in 2002, the Rama VIII Bridge is another sculptural addition to Bangkok's skyline. A single pylon rises from the west bank of the Chaophraya River. From it a series of golden threads stretch out over the river to hold up the road surface which arches gracefully over the river. The pylon is topped by a sort of flame, also painted a golden color. You can see it from much of the old royal city, especially the Golden Mount. There was talk when it opened that an elevator would be installed to take people up inside the pylon to its top, where the view is supposed to be fantastic, but it's not open as yet.